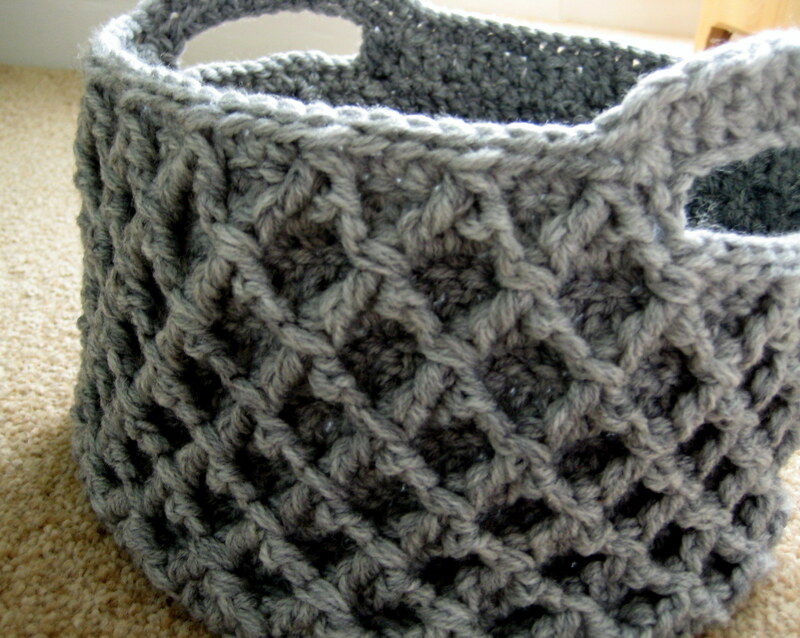 Stiff sided diamond trellis basket crocheted from stash yarn for storage – can be made in any size! I’ve had this idea in my head for a while. When I was making my Zigzag Scarf and Diamond Cowl patterns I noticed that this stitch results in a firm fabric. Dense and cosy for a scarf, but when worked with a slightly smaller hook it becomes stiff and therefore ideal for baskets! When I got all this yarn from my Great Aunty Di this was one of the projects I thought I’d make. I had about 200g of dk yarn in several part used balls of grey, all very similar but I knew it would show that they were different if I tried to use them all in one item – unless I crocheted something with them all held together! Update 21/08/2014: You can view my video of the stitch pattern here! I used 3 strands at once and a 6mm hook. You really could use a mix of different colours and yarn weights if you prefer. 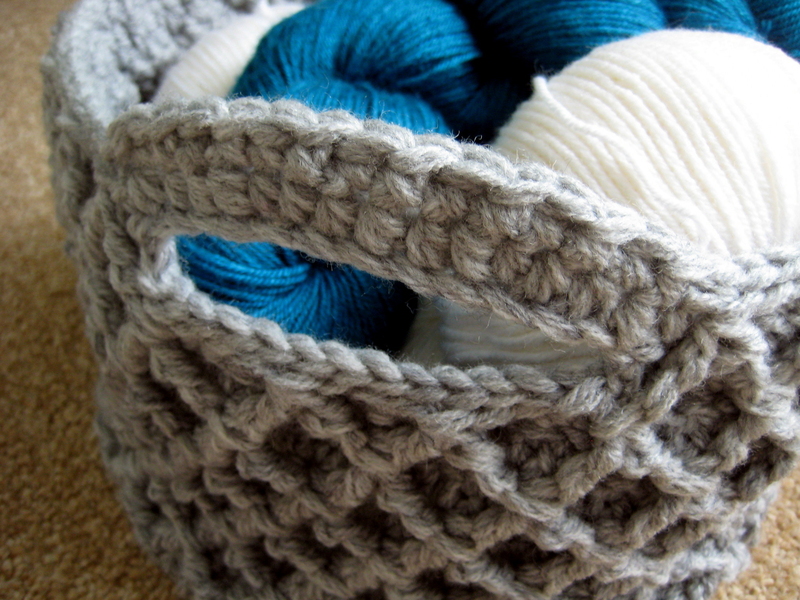 Handle detail of Diamond Trellis Crochet Basket – free pattern! I designed the pattern so that it can size up or down depending on your needs and yarn supply. Just make more or less rounds for the base! To get the proportions right I used about a quarter of the weight of yarn I had (46g) for the base before moving on to the sides. 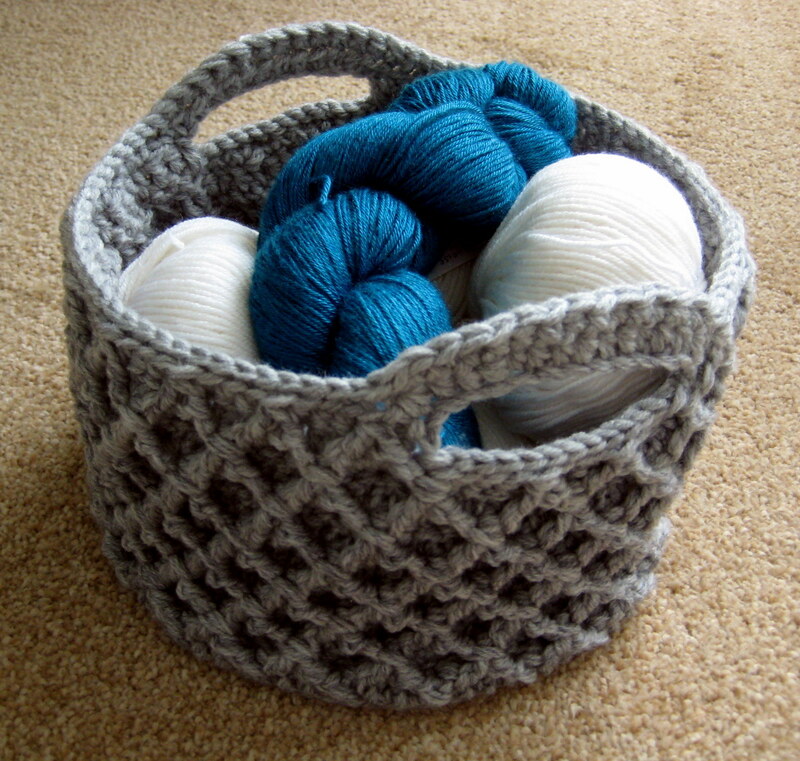 So if you want to make a larger basket using stash yarn just weigh it first and use about a quarter for the base! Mine turned out to be 9 inches wide and 6.5 inches high (23x17cm). 200g of either 3 strands of dk weight yarn or 2 strands of worsted weight yarn, held together. Yarn over hook twice, insert hook horizontally (from front to back to front again) behind the “post” of the 2nd dc in the row below, yarn over hook and draw up a loop (4 loops on hook). *Yarn over hook, draw through 2 loops, repeat from *, 2 loops left on hook (one arm of the V made). Yarn over hook twice, skip 3 dc posts, insert hook horizontally behind the next post. Yarn over hook and draw up a loop (5 loops on hook). *Yarn over hook, draw through 2 loops, repeat from *, 3 loops left on hook. Yarn over hook, draw through all three loops. There will be an “unworked” stitch left in the row below (behind the newly made fptrc2tog stitch). The remaining fptrc2tog stitches of the first round using the stitch are worked the same way – with the first arm of the V worked around the same post as the last arm of the previous stitch. After the first round using this stitch the fptrc2tog stitch is worked around the top of the previous fptr2tog stitches rather than the dc posts. Update 21/08/2014: You can view my video of this stitch here! The basket is worked in the round from the base up. If you prefer a larger sized basket, you can continue in expansion pattern – just finish the base with a sl-st into the back loop only. My basket (pictured) had a base stopping at round 11. In round 13 the fptrc2tog stitches are worked around the dc posts of the row below. R13: ch1 (counts as sc), turn, 2sc, fptrc2tog, *3sc, fptrc2tog, repeat from * around, join with a sl-st into first ch (22 fptrc2tog sts & 66sc sts – 88 sts total). In round 15 the fptrc2tog stitches are worked around the tops of the fptrc2tog sts 2 rows below. This forms the diamond pattern. R15: ch1 (counts as sc), turn, fptrc2tog, *3sc, fptrc2tog, repeat from * around, 2sc, join with a sl-st into first ch (22 fptrc2tog sts & 66sts – 88sts total). R17: Repeat round 13, working the fptrc2tog sts around the tops of the fptrc2tog sts 2 rows below. Repeat rounds 14-17 until your basket is the desired height for handles – I took 6 more rounds (i.e. made mine 2.5 diamonds high to the handle). You will need to complete either a R15 or 17. Handles: This step neatens up the edge of the basket under where the handles will be. If you just completed a R15: do not turn. If you just completed a R17: do not turn. Make 2 regular sl-sts – one in each of next 2 sc. You should end up with a fptrc2tog st as next st to be worked. Working in the back loop only, sl-st 12 times, and then work a sl-st through both loops of the next st to secure (this should give a stretch of sl-sts from the top of one diamond point to another 3 points away). Break yarn and skip 32 sts, re-join the yarn with a sl-st in the back loop of the next st (it will be a fptrc2tog st). Working in the back loop only, sl-st 12 times, and then work a sl-st through both loops of the next st to secure (this should give a second stretch of sl-sts from the top of one diamond point to another 3 points away, directly opposite to the first stretch). The second round of the handle is worked in pattern as for main body of basket, but with alterations at the handle areas. HR3: *working in the back loop only, sl st 30 times (i.e.until the next hdc2 tog in row below). Working through both loops, sc 14 times (across the handle top). Repeat from *, and finish with an invisible join into the next st (or a sl-st if you prefer). I do not recommend blocking this piece – we want the fibres to stay nice and stiff so that the basket has structure! Diamond Trellis Basket -free crochet pattern which can be made in any size – and it is just nicely stiff too! Free pattern for crochet basket – Diamond trellis stitch makes the sides stiff and it is made in one piece! If you make this basket in a larger size then please do let me know how much yarn you take – I’m sure it will help others making this project. 1. The original pattern contained a couple of errors (as you will see from the comments!) I have corrected for these and updated the pattern in both the blog post and pdf patterns. 2. Some users (but not all) are having some difficulty viewing the pdf patterns. They appear to be showing the text in white on a white background. I am looking into what could cause this; please accept my apologies in the meantime, and if anyone is more of a computer tech than I am and knows what causes this please let me know! 3. The lovely Marira has translated this pattern into German – you can get it for free here (you may need to register). The fabulous Marjolaine of Planete Laine has translated this pattern into French – you find it here! Thank you so much for this wonderful pattern! I was wondering if there is a reason why you didn’t start the sides with sc, but with dc instead. I looked at your video tutorial and in that you do the first round into the sc below. In this pattern, however, you do it straight into the dc row. I guess I was just wondering if there is a special reason for this. You’re welcome Heather! There is no special reason, I think I just did it that way. In retrospect I probably would add in a round of sc, but I didn’t want to alter the pattern as then the pattern and the picture of my finished item would be different and it’s confusing for those of you with eagle eyes! You can add in a round of sc if you like, but don’t turn at the end else your diamonds will be on the inside of the basket! Hi Kathy As with the other rows, whenever the instruction is in brackets() it is to be worked in one stitch. So it is saying to work 2hdc in one stitch, then one hdc in to each of the next two stitches, and then repeat the sequence around. This adds 8 stitches to the round (as does every round of the base. Hope that helps! do i need 200 gms each of the three strands i would be using? it is obvious but i just wanted to check anyways. I rarely, if ever, comment on the internet, but I had to thank you for this fantastic basket pattern and more importantly, the video tutorial! I watched and stopped the video no less than 15 times, trying to get my hook where it needed to be. It took me a few tries, several complete redo’s and I had to step away from my project more than once so as not to set it on fire, but I finally had my “aha, I get it” moment today and I’m having so much fun! I love the look of this pattern and I can’t thank you enough for posting the video. It was a huge help to me and I’m sure to all my fellow visual learners! As a side note, I have never used stitch markers before and they were a huge help to me in doing this project. I highly recommend them for anyone making these baskets. Thank you again!!! I love this basket and am looking to make it for my sister for her bday. What ply is the yarn you use? I know you use 3 strands at a time and I would think 4 ply would be to thick to do 3 strands at a time. I was thinking of doing just 2 strands one 4 ply and the other a little thinner. Would this be thick and stiff enough or should I do 2 strands of 4 ply and 1 strand the thinner one added in in a contrast color? Hi Penni! It is meant to be thick as this helps the basket hold its shape. I suggest you make the sample shown in the video (written pattern in the same blog post) and see whether you think it is coming out sturdy enough or not for what it will be used for. Love this basket! I’ve pinned it and am rethinking my planned projects. I might have to do this one right after my current crochet project rather than the cross stitch I was planning on for a change of pace. Thanks Kristina! For me these are a good break from “fine detail” projects – I hope you enjoy it! Many thanks for making the video I probably wouldn’t have been able to do the diamond stitch otherwise. I made a basket for a friend with two separate colors, cream for the bottom and “background” stitches and grey for the diamonds. It turned out well, although carrying the colors throughout the pattern was a little annoying. :) If I made another one I’d definitely do it in just one color. Thanks so much for the free pattern! Hi there! I have just finished making my first basket and loved it. It is such a lovely piece! I am now working on a smaller one to make a “nest” of baskets for a housewarming gift for a friend. Someone has also asked about making a bigger one for a dogs bed! That’ll take loads of yarn! Thanks again for a great pattern! Thank you SO much for the wonderful tutorial! I don’t think I could have made the basket without it. I’d like to make a smaller one now. Do you know if the diamond pattern will work if I choose to end on ANY round? Or, do I need to end on a specific round, or an odd-numbered round? Thanks for any guidance on smaller baskets! Thank you for the speedy reply and for the tip about the handles. I plan to make several of these for gifts for Christmas. Thanks again for the wonderful pattern! Hi Brenda! It sounds like you are doing it right – increasing numbers of hdc’s in between each increase (2hdc in one st). Are you doing hdc’s (and not dc’s)? You wrote dc but I wasn’t sure if that was a typo. The other thing is it’s quite difficult to make a perfectly flat circle (especially without blocking) because of gauge variations. If you are doing it right it sounds like you may need to go up or down a hook size. The other thing you can do is increase the number of stitches in the first row (and then in each subsequent row) – just make sure you have a multiple of 8sts in your final round before you do the sides. Yes, you can do that too! I hope it turns out well. I bet the twine will make it last for ages! Sorry for the typo’s. This auto correct gets me every time. I’m glad you like this one Elsie! Basket weave stitch will make a nice thick fabric too, and I have seen a few baskets made using it. it might not be as stable as diamond trellis stitch because on diamond trellis the slanted stitches act like cross bracing. So you may find it helpful to size your hook down even more on your basket weave version! Love this pattern. Is it possible to make this using fpdc instead of fptrb? I just can’t seem to master the treble stitch but would love to give this a try. Just discovered your site when I found the Summer Sprigs Lace Scarf and have added you to my Favorites! Patterns look lovely and very creative…….I hope to work on many of them. Detail photos are exceptional! Thank you for your help. I really love the basket. Hi, I just printed my pattern, and I can’t wait to make this Basket!!! Hmm bathroom décor, yarn projects, perfect for gifts.. and the list goes on! Hi Maria! Just work one stitch into each stitch around. You are working the sides now so you want them to stay the same size all the way up! Hi Carral! Did you watch the video on how to do the fptrc2tog stitch? Thank you for this stunning pattern. I made one as a peg bag and experimented with putting a colour into the background. So pretty. That sounds lovely Carolynn! :) glad you like it.